The next step in building a go kart is to weld the motor mount to the frame. 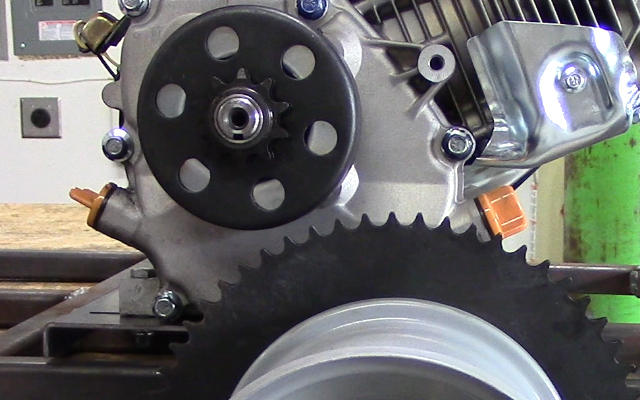 This guide will show you how to line up the clutch and drive wheel sprocket, then weld the go kart engine mount in the correct spot for future chain tension adjustments. Insert two bearings into the drive wheel, one on each end. 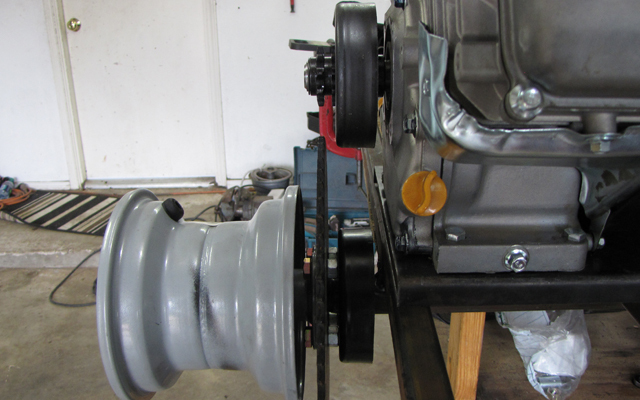 With the drive wheel laying on its side, insert four 5/16-18 x 1 1/2″ bolts through the go kart drive wheel hub. Insert the 60T 420P sprocket over the four bolts, and secure it by threading four 5/16-18 nuts to the bolts. Insert the 4″ brake drum over top of the bolts, and secure it by threading on an additional four 5/16-18 nuts to the bolts. Slide the drive wheel over the driver’s side stub axle, and hand tighten the 5/8″-11 drive wheel nut to secure the drive wheel assembly to the axle. Spin the wheel by hand, it should continue to spin without binding. If it stops abruptly, loosen the nut. The sole purpose of the nut is to keep the drive wheel from sliding back and forth, not to be tight. The clutch will slide right onto the engine shaft. Align the 3/4″ bore go kart clutch to the go kart axle. Make sure you put the 3/16″ key in the clutch, then slide it onto the shaft. A 5/16″ flat washer should be inserted over the end of the engine shaft and a 5/16-24 (fine thread)x 1 1/4″ bolt is typically used to secure washer and clutch to the engine shaft for most 5-7hp 3/4″ shaft engines(e.g. harbor freight 212cc engine used here). Some clutches come with threaded holes for set screws as well. If your clutch comes with holes for set screws, use an Allen wrench and set screw(s) to secure the clutch to the shaft. 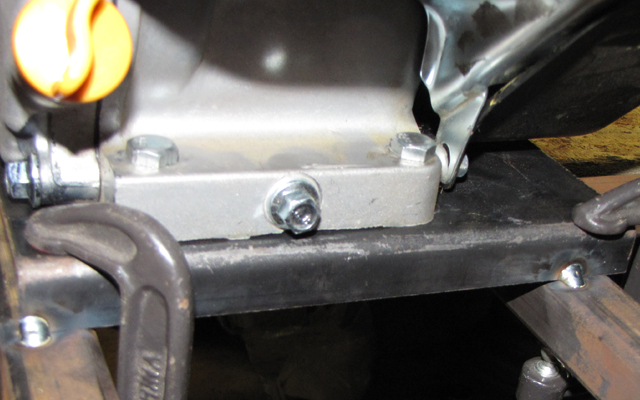 The go kart engine mounting bolts are 5/16-18 x 1 1/2″ bolts. Insert all four of them into the motor mount, and secure them with the four 5/16-18 serrated flange nuts. Make sure you have the engine slid rearward on the slots. As the chain stretches over time, you will need to move it slightly forward so it is important that the engines default position provides for maximum travel forward. After you have the engine secured to the go kart motor mounting plate, line up the clutch with the drive wheel sprocket with a straight edge. The face of the sprocket should line up with the face of the clutch’s drive sprocket. Lay the chain across the drive wheel sprocket and the clutch sprocket. The chain that comes in the go kart parts kit is a few links too long, so you will need to shorten with your angle grinder. I marked the link that needed to be cut out, then cut off the top of the pin and link, then removed it with a hammer. I did this all from a bench vise. You can also remove pins with a small nail and hammer, or a special tool called a chain breaker. Once you have the chain cut to length, insert the master link clip. I wrote an article about how to install a master link clip if you aren’t sure how to do it. It is important that the engine shaft is parallel with the axle shaft, and that the go kart motor mounting plate is positioned forward so the chain is just a tiny bit loose. 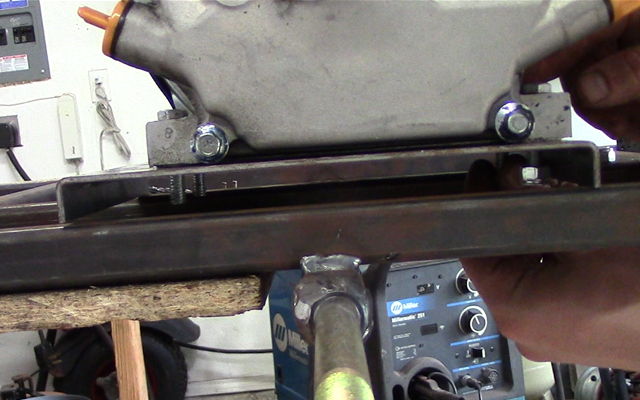 Once you have the mounting plate adjusted, clamp it down with four c-clamps, and tack weld the plate on the four different corners that sit on top of the frame. After you are absolutely certain that everything lines up between the engine, chain, drive wheel, and seat back, then weld the go kart engine mount to the frame. I saved this step as the last weld before painting after I had already test driven the go kart. 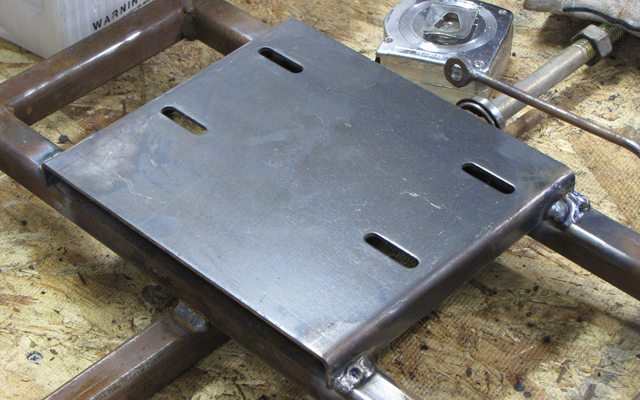 Now that you have the go kart motor mount installed, you are one step closer to finishing the kart! Lets move onto the next step, the seat. Hi there . I have a cn250 motor on a buggy I turned it on one day and the wires from the three phase regulator. To the cdi had burned up and melted the insulation on the wires. Since then I replaced the CDI the three phase regulator starter solenoid and starter and it happened again do you have any ideas what it could be?? Any help will be appreciated thanks ..
call up gopowersports for that. There are too many variables to look at right now over the comments, so a simple phone call will fix it fast. Can anyone help, im installing a 420cc predator on a buggy but i dont know why for some reason when i give it gas it only goes in reverse and not foward. How far on the shaft should the clutch slide, the key only allows it to go to about one inch from the engine. Does the key need to cut? We @ Sheba Shrine club “Knight Riders” have 10 Go Karts that we use in parades . We are using 410 350 5 tires, how do we overcome this problem we break 2 or 3 chains per outing. Are there larger tires or mabe 6″ rim with the same bolt patern as the 5″ rim??? we have 4 belt drine units they are OK but to switch the other units to belt drive is cost prohibitive! see if you can find bigger tires with the same rim size. Where did you get your rear drive wheel and sprocket. I’ve been looking all over the web and need a setup like yours but with 4 inch rims. Any suggestions on where to find with the wheel sprocket and drum? check out the free plans page, and it has a link to the kit https://kartfab.com/go-kart-plans once you open the kit page, you can click on the individual parts to get just those. clutch must be in the same plane (use a straight edge to align). If I’m reading between the lines here, you are asking if the clutch can be only directly above the center of the sprocket, or can the clutch be in front of or behind the sprocket. The answer is in the plans, page, and on the video if you are curious. But to let you know again, the clutch can be in any position as long as it is in the same plane as the sprocket. Needs to be aligned with straight edge aligned to the face of each sprocket. They came with the Karts when we bought them many years ago. Princess Auto has a great selection ? can you source a sprocket for the engine shaft? you can get the engine to push start that way but the kart will stall if you stop. Try to see if you can order something from china directly if shipping from the usa is too expensive. 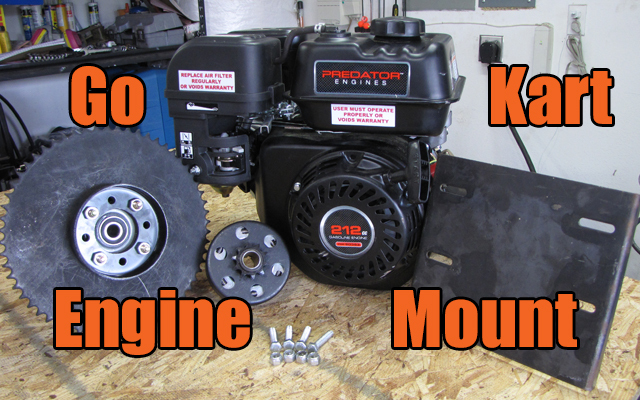 Would it be different if I used the 420 cc Predator engine on a go kart? Is a torque wrench necessary? to install an engine on the mount? nope, but id use a nylock nut or thread locking compound to hold it in place. I need to put a predator engine on my bicycle. AlI can find is a mount plate, without chain and sprocket. Do you have this? Alright so ive got a stock asura cart i built, but the engine mount was so thin it bent. I unbent it and am going to use a bar of 5 mm steel laying on the frame on top of the mounting plate to remount the engine so it cant bend again. However, i do not own a welder, nor do i have enough money to get it welded for me. Can i just have the bars laying on the frame or should i get them welded? weld it, take it to a shop and explain it just needs to be welded, it is very cheap to do that if you have all parts cut to size. no problem man, thanks for the comment. You can make anything you want just needs to be welded for it to work well. I have a shrike mini bike. The stock engine mounting plate is about a 30 degree angle. Can I mount a Predator at this angle with out messing up the oiling system and the carb function? You should ask this at a 4cyclekarts or diygokarts forum. Typically adding more oil is fine, but im not sure how much. Engines with float carbs can operate on different angles too, but again, not sure how much. Also you may have to deal with the psychical dimensions of the motor and bike not panning out. This is something you can easily find out by looking in the users manual and by measuring your mini bike with a tape measure. What is a good ground clearence for the sprocket. I am basing mine off of you free plan but adapting to a live axle. Currently from sprocket tooth to ground i have about 1 1/2″ , is this enough or should I use bigger rear tires than the 13″ I currently have ? Ground clearance is dependent on where you are going to drive. If it is just street, then you would be fine. If you take it off road you may hit some rocks with it. I have no idea why you went with smaller tires in the first place if you are doing live axle. 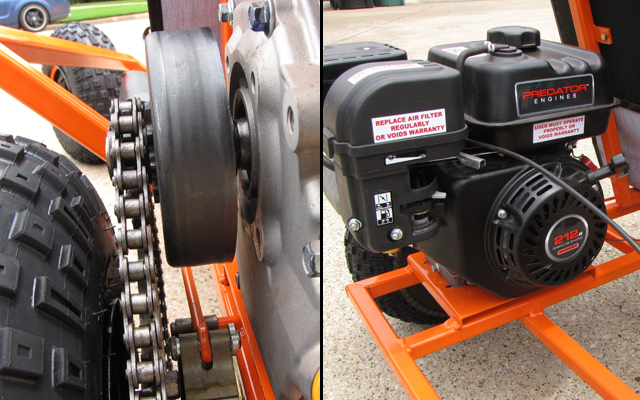 Just to give you some insight into go karts with that same 60T sprocket, most use 18″, 20″, and 22″ on a live axle. Thanks for the insight, this is learn as I go. I’ll what i can find to use for a larger rear , as I am only running a 5hp – 208cc briggs engine. I was worried for loss of speed etc. From where should i buy the engine. Hey i love your free plans so much that i started making a go kart myself. The problem is that i got my own parts and the 72 tooth sprocket is pretty crooked. is this normal. If not, will a 60 tooth be better. Well, you should have followed the plans. I guess you found that out the hard way. I would speak with the part store you got your sprocket from to see if you can fix the ‘crooked’ sprocket. Its normal to have a little run out on the sprockets. Did you remove the governor on this engine? No. The governor was not removed. I just bought a used old go cart. It’s pretty rough. I am going through it and fixing all the old issues. I noticed it’s only a one wheel drive. Is this the norm? Also the chain is really rusty and doesn’t seem to have a link pin, it’s more like the pin was punched over with no slip clip. Is this right or do I need a new chain? Any help will be appreciated. One wheel drive is common. Most karts have a master link for the chain. Check on both sides of the chain. If the chain is old, it’s usually best to replace it. thank you for the assistance. I will examine it more closely. What is the difference between a 10 and 12 tooth clutch? I’m leaning toward the 12, seems to be more the majority uses. Great site too, thank you for all your time and effort. I’ve picked up a “project” used kart on CL to refurbish for my two girls (9 & 6). 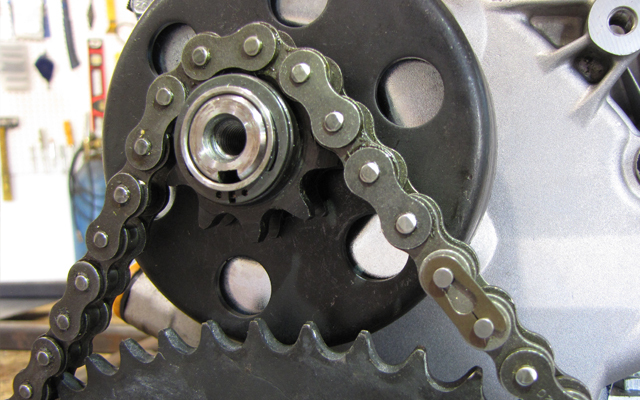 Usually a 10t clutch is for a #40/41/420 (1/2″ pitch) chain. Usually a 12t clutch is for #35 chain (3/8″ pitch). It’s not exclusively like that, but for the most part it follows the trend. As a rule of thumb, for your size engine, and a centrifugal clutch, you want to gear around 24 mph at 3600 rpm. That translates into about a 6:1 gear ratio (axle teeth / clutch teeth). It is also important to see what size tires you have. If the tires are bigger than 16″, you probably need a 30 series torque converter. If the tires are smaller or equal to 16″ diameter, you should be ok with a standard centrifugal clutch for driving around on relatively flat surfaces. $20 is the cheap clutch and $80-$100 is the long lasting heavy duty clutch (anywhere online this is true). Does it matter if the engine is in front of the axle or behind it? Doesn’t matter. The engine was mounted almost centered above the sprocket, and slightly forward to tension the chain. You can install it any way you like. which engine alignment is better.. front or behind?? is there any problem with weight distribution in front end allignment..
either one is fine. I pushed engine to front so center of gravity is more toward middle of go kart. Ok thanks. Was there a reason you went with forward movement to tension as opposed to reverse movement? What is the height of your engine shaft from motor mount? Just want to compare the motor i have. Thanks so much for the help. What are we shooting for as the initial positin of the motor? Clutch sprocket right above wheel sprocket or forward a bit? Final position of clutch was slightly forward. I installed the engine ‘slid back’ on the mounts, then installed the chain slightly loose. After final welding I slid the engine forward to tension the chain.